Add more oil if necessary and add veggies in single layer and grill until tender and browned in areas. If you need to grill in batches I’d recommend you start with the peppers as they take the longest. Then you can quickly set them aside on a plate while you finish with the zucchini and any other tender veggies you have. 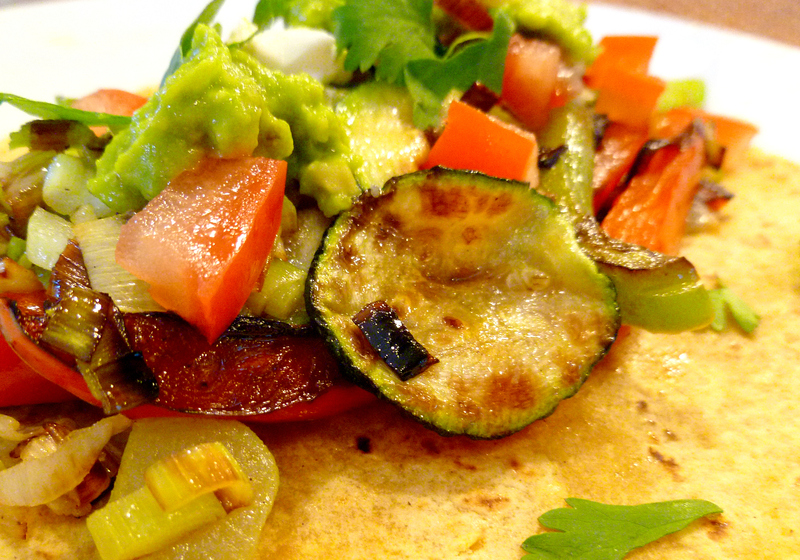 Remove the veggies from the grill/griddle and quickly set the tortillas on it. Flip after 20-30 seconds and warm the other side. Remove from heat. Add an even amount of veggies to each tortilla, top with diced tomato, and serve with cilantro, vegan sour cream, guacomole and salsa. Footnotes: I really like grilling these on a LARGE stovetop or electric griddle as pictured below. That way it keeps it super simple and you can likely grill ALL the veggies at the same time without having to do it in batches. 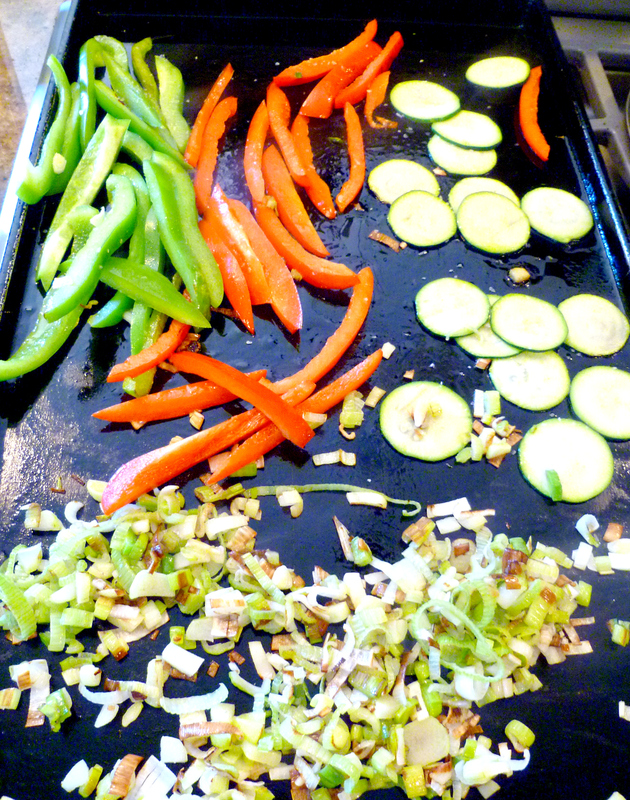 Start the onions and peppers first, then after 3 minutes or so add the other veggies to the griddle too. If you are using zucchini, your mandolin comes in really handy here. You can slice the whole thing in a just a few seconds and come out with really thin slices. I love sauces and garnishes, but the flavor of these grilled veggies is so good, I really like to keep the extra sour cream, guacomole and salsa to a minimum. I put very little on otherwise it drowns the fresh grilled flavor of the veggies. If you want to make this even more hardy, add in some black beans or rice. 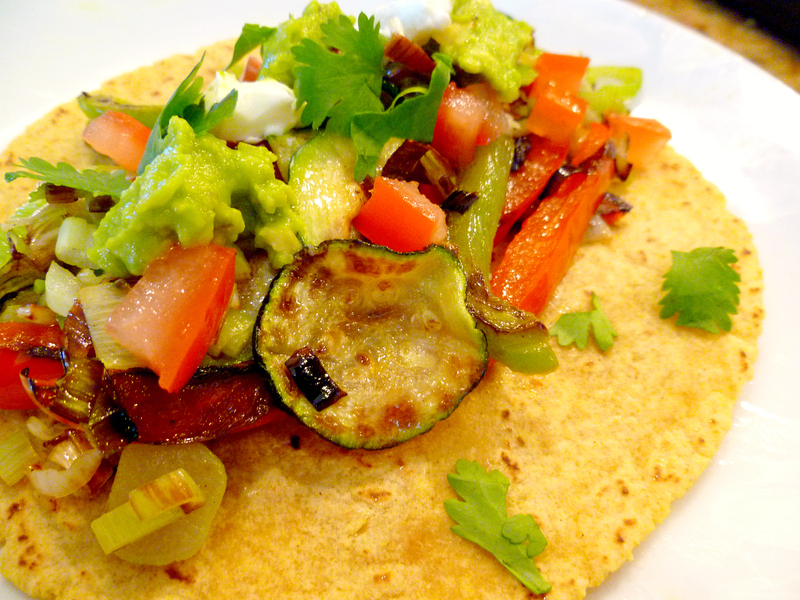 I personally like this simple dish with just the veggies as it’s something different from your everyday Mexican. We like these fresh so I only make enough for the meal at that time. However, I cut up extra veggies when I am doing all my chopping and then pop them in the refrigerator for the next day. This is great to make on a Friday night. If you cut up some extras then you can cook them up Saturday for lunch. Just take out the sliced veggies, heat up the griddle and you have lunch in under 10 minutes. Use a large stovetop or electric griddle so you can make this super easy on yourself and grill all the veggies at once. Start with the onions and peppers first then add in the zucchini as they won’t take quite a long to cook. You really want to get that browning going like you do on a grill–that’s what gives these a summery delicious taste! Cut up extra veggies so you can pop them in the refrigerator and make these again for lunch or dinner the next day. Your veggies will be all ready to go and you’ll have a delicious meal in just a few minutes. Grilled food in the Winter is best! Love your blog too by the way! these sound super delicious! 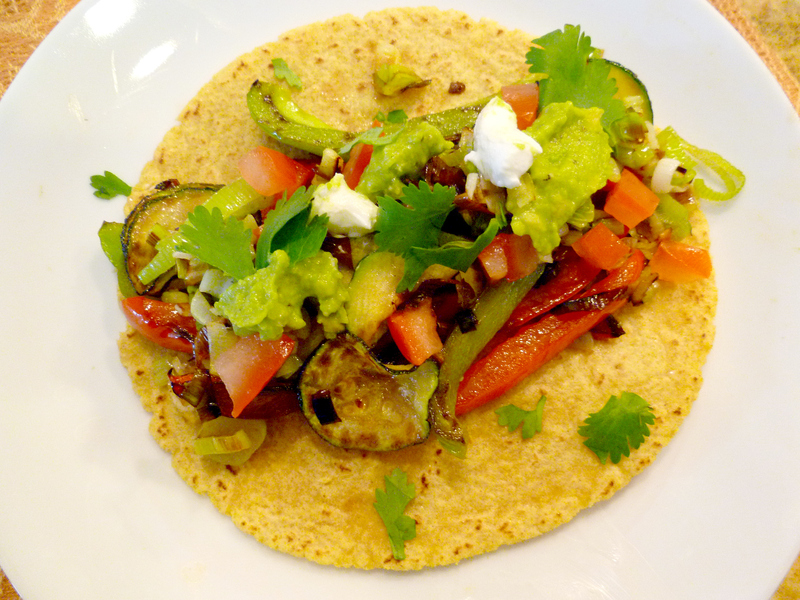 I have been on a bit of a mexican food kick and am so happy when I find a yummy dairy-free mexican recipe. they are hard to find! I know what you mean about finding dairy free Mexican food. Usually it’s loaded with sour cream and cheese. Have you tried Daiya brand Vegan cheese? I use it in recipes that call for cheese, especially when it’s baked, etc. It’s delish! I have used Daiya and I like it, but it is a little pricey and I have enjoyed making foods that don’t make me miss cheese because they are yummy without. I have no doubt this would be one of them! This is simply beautiful. 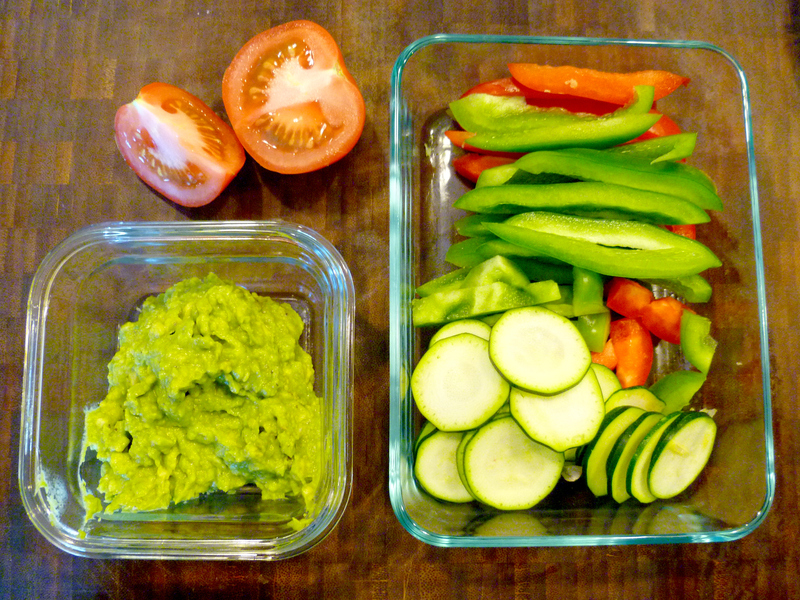 I love all the bright colors of the fresh veggies. Perfect soft tacos. Thanks! I hope you enjoy. Let me know if you change it up. These are a summer favorite of ours! I never do them on my grill pan, though–great tip for year-round grilled veggies! Beautiful!! We have been grilling EVERYTHING these days…right now I am addicted to grilled peppers. Was home one morning a week or so ago and grilled a whole tray of them for breakfast, just for me! Thanks for the post and the great photography!